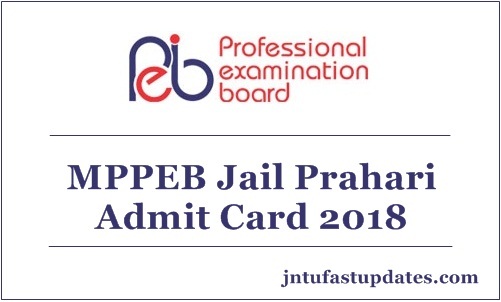 MPPEB Vyapam Jail Prahari Admit Card, Exam Date 2018: Madhya Pradesh Professional Examination Board (MPPEB) has scheduled the Jail Prahari examination on 29th and 30th September. Competitors who have applied for MPPEB Jail Prahari posts in the month of August can proceed to attend the Jail Prahari examination in the month of September. Before attending this written test, the competitors must get the MPPEB Jail Prahari to admit card/hall ticket to proceed with the examination. Aspirants can download Jail Prahari hall ticket from the official portal, peb.mp.gov.in. Candidates who do not show the admit card at the time of verification will not allow to the examination. So, candidates are advised to carry the admit cards without fail. Download and take a printout of the admit cards to carry to the examination. Madhya Pradesh Professional Examination Board (MPPEB)/MP Vyapam recently announced 475 jail prahari posts. Many of the candidates seeking to get Jail Prahari posts in Madhya Pradesh have applied from 11th August to 25th August. Hopefuls seeking to get MP Vyapam jobs have applied for the MPPEB posts. The MP Vyapam is going to select the aspirants based on various rounds of selection process such as written test, and interview rounds. The organization is initially going to conduct the Jail Prahari examination at the end of September. Hence the hopefuls applied for MPPEB Jail Prahari posts can download the admit cards to attend the examination. The admit card/hall ticket will be accessible to download @ peb.mp.gov.in. MP Vyapam is going to release the MPPEB Jail Prahari admit card before 10 days of the examination (approximately). Applicants can keep visiting the Madhya Pradesh Vyapam official website, peb.mo.gov.in to download admit card. The organization will announce the admit card/hall ticket/ call letter release date before it releases the hall ticket. Keep checking the portal on regular basis for time to time updates. Applicants can check the details of their examination center, date and time of examination from it. Candidates have to report at the exanimation center before 30 minutes of the examination. Also, carry any of the valid identity proof copy along with the hall ticket while going to the examination. After the verification of an identity of the candidate, he/she will be allowed to attempt the examination. Applicants can also check their details such as name, date of birth, hall ticket number, signature, photograph and other details from it. Also, the other guidelines for the examination will be mentioned on the hall ticket. Candidates can check all the details thoroughly once.